It's competition time and this time I'm giving away some Crayola goodies. There's nothing like a stash of Crayola felt tips and pencils for when you're in the mood to let loose and get creative. Oh, the kids love them too. 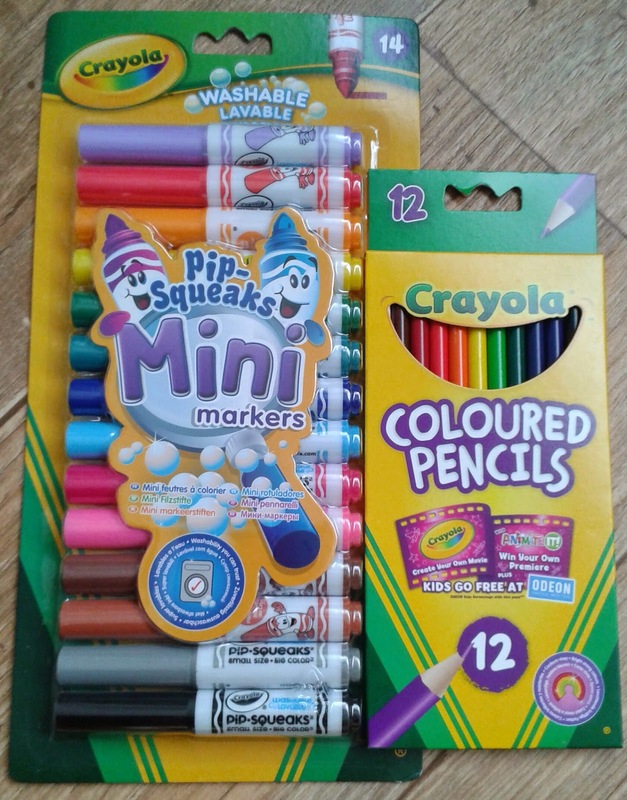 There are 14 bright colours in the Pip Squeaks Mini Markers set and 12 coloured pencils. The Markers are washable so if a little of your childs creativity does end up where it shouldn't, it's not a problem. They are ideal for round the house or can be whipped out on long journeys once Eye Spy has lost it's appeal. If you would like to win this set then all you have to do is enter via the rafflecopter below. At the moment it's fish with my 2 year old niece. Every single picture is a fish. faces although i'm not very good at it! I like drawing animals for my kids! I tend to draw flowers, or anything my youngest neice asks me! I love drawing flowers the most. I always doodle stars and 3D boxes, can't properly 'draw' anything really! I'm atrocious at any form of art but give me a crayon and I always draw a house - probably because it's square with more squares for windows! They like to draw caravan holiday sceans. Generally flowers, or houses when I doodle while I'm on the phone. They love to draw houses and clouds. i always use to do this when i was younger and i now do it for my daughter well i just get a pencil and sort of scribble all of the paper and colour in the shapes that come from it. I have attempted flowers, but I think my son's Iron Man is better! I love to just doodle and see what I can come up with :) it can be anything from random patterns to words! Houses with flowers in the garden. jayden loves to draw mr tumbles, spots everywhere! Dinosaurs, they are my sons favourite! Still in the scribble stage, but hoping we move on to houses and family portraits very soon!! I like drawing animals and funny faces with my Daughter! i love drawing birds, i have done so for years, mainly water birds and garden birds. Animals for my son to colour in! I am not very good at drawing but the best thing I ever drew was a drawing of Winnie The Pooh for my daughter! My favorite thing to draw now with her is scribbles! Flowers are about all I can draw! Animals - I love drawing wildlife. At the moment my daughter is into me writing her name over and over again for her, and drawing around her hands! I like to draw mountains and the trees. I'm big on doodling when in meetings and I tend to do cartoon snails or if I'm feeling more artistic, eyes. I'm not much of an artist but would love to win this prize to donate to charity, to go to Romania. I love drawing hearts and do so repeatedly when Im doodling! Random patterns as I cant draw to save my life! I'm rubbish at drawing. Match stick men are about all I can draw. I like to draw fun cartoon-like animals and birds. I love drawing owls - they are my favourite animal and I am mad on them! I am dreadful at drawing, but I draw a variety of things for my step-children! We drew a gruffalo the other day! Fashion! All things clothes and beauty! I love drawing with my son - we usually draw dinosaurs!! I like drawing nature - pine cones and leaves. My favourite things to draw is anatomy, specifically facial features and hands!